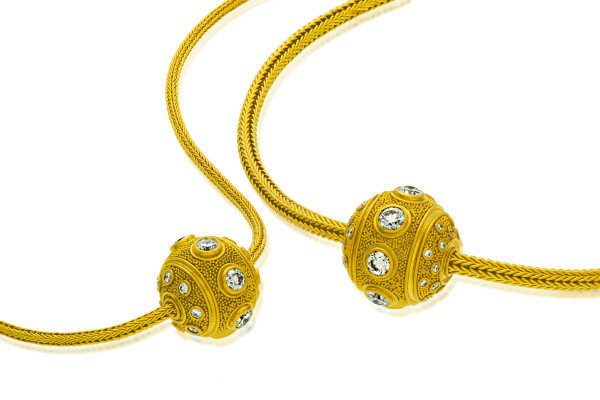 22K gold spherical pendant with alternating diamond (2.0 ctw). Adorned with thirty two diamonds (.32 ctw) in a random pattern. Approximately 3/4” high. This piece is shown on the 22K Hand Woven chain featuring a removable termination allowing the pendant to be taken on and off (sold separately). The Petite Diamond Bead is also in 22k gold and has 1.19 ctw diamonds around it’s center. It is shown on our thinnest Hand Woven chain which also features the removable termination (sold separately).